If you are suffering with symptoms of chronic sinusitis, and you have already been through the remedies, medications and antibiotics without relief, Riesberg Institute has an alternative for you. We offer you a proven, long-lasting solution that can restore your ability to breathe with a brief, in-office procedure. In the past, you had only two treatment options for chronic sinusitis. Medication therapy didn’t always work, and traditional sinus surgery was aggressive and had an uncomfortable and prolonged recovery. But Ear Nose & Throat professionals have opened new doors to treatment by incorporating concepts from the field of interventional cardiology where tiny balloons have been used for years to gently dilate blocked arteries. At Riesberg Institute, our patients take center stage. The skilled specialists at Riesberg Institute strive to relieve pain and improve your quality of life. If you are a new patient, please review the New Patient Paperwork and other forms. Filling out forms ahead of your first visit will save valuable time when you arrive at the office. One of our core values is patient education, and we believe in sharing as much helpful information with you as possible. With that in mind, we are providing an Educational Resources Section, Frequently Asked Questions Section, and a Media Library. If you have a question about anything —you are welcome to contact us at 850-476-0700. Dr. Riesberg will begin by applying a local anesthetic to the sinus area to be treated. After you are completely comfortable, he will insert a flexible catheter with a tiny balloon into your nostril and place it at the blocked sinus passage. He will inflate the balloon briefly to expand and reshape the area. Dr. Riesberg will then deflate and remove the balloon, restoring your airflow, drainage and normal sinus function. 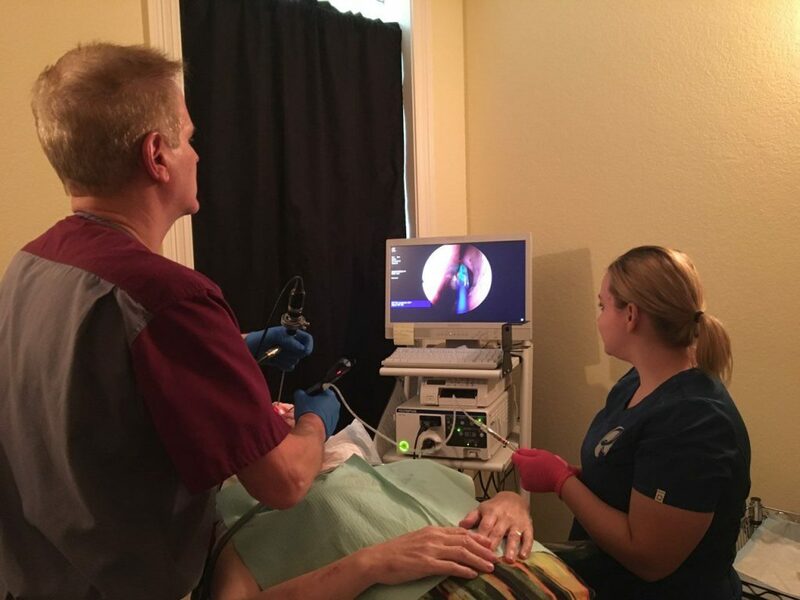 The procedure typically lasts about an hour,7 and most patients resume normal activities within 24 hours.9 Many patients report immediate improvement in the ability to breathe normally as well as relief from sinus pressure. That’s it. It’s just that simple! 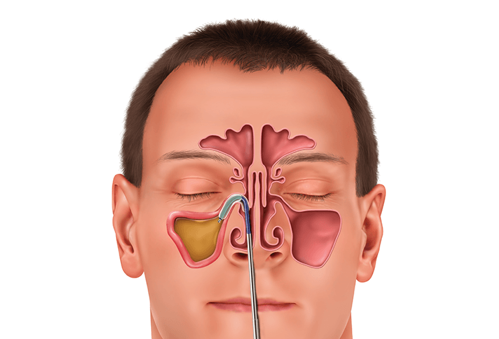 Are You a Candidate for Balloon Sinus Dilation? If medical treatment has failed to provide you with significant relief from chronic sinusitis symptoms, Balloon Sinus Dilation could be the solution you need. To find out if you are a candidate, start by scheduling a consultation with our ENT specialist, Dr. Michael Riesberg. After an examination and complete history of your symptoms, he will know if additional diagnostics, like x-rays or a CT scan, are necessary. Dr. Riesberg will work with you to provide the best treatment options for your personal diagnosis. Weiss RL, Church CA, et al. Long-term outcome analysis of balloon catheter sinusotomy: two-year follow up. Otolaryngol Head Neck Surg 2008; 139:S38-S46. Soler ZM, Rosenbloom JS, Skarada D, Gutman M, Hoy MJ, Nguyen SA. Prospective, multicenter evaluation of balloon sinus dilation for treatment of pediatric chronic rhinosinusitis. Int Forum Allergy Rhino, 2016. Gould J; Alexander I; Tomkin E; Brodner D. In-office, multisinus balloon dilation: 1-Year outcomes from a prospective, multicenter, open label trial. American Journal of Rhinology & Allergy 2014 Mar-Apr;28(2):156-63. doi: 10.2500/ajra.2014.28.4043. Epub 2014 Feb 14. Karanfilov B, et al. Office-Based balloon sinus dilation: a prospective, multicenter study of 203 patients. Int Forum Allergy Rhinol; Nov 2012 Epub.